Tomatoes are all looking good now after being transplanted from the seeds I started in the kitchen. I had doubts about two of them right after they were transplanted but they perked up. It’s important to consider transplanting to be like surgery: do it well and it’s just a minor injury. Do it badly and it’s like amputation. And it’s always at least a shock. Once things are transplanted there will be some wilting and probably a few lost leaves. What we see on top of the ground is just part of what’s happening underground as the little plant tries to reestablish its root system and develop a life that can provide nutrients for itself, so it can continue the growth it had started before the transplanting. 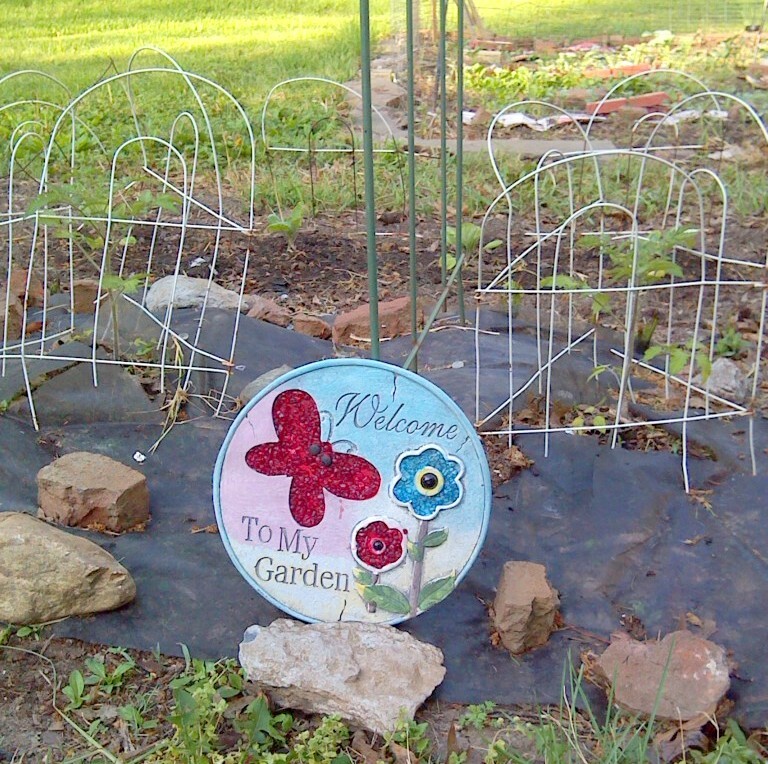 My daughter in law Eliza got me that pretty marker that announces that we’re growing a good garden here. I always planted small amount of things just for myself and some to share. Now I have a co-gardener and it’s our garden, and it’s still small amounts but it’s expanded in scope. Eliza digs up spots that I can’t due to recent shoulder surgery, hauls bags of soil for containers, and has been involved in all of this year’s garden from the start. She gets as excited as I do when things show their growth, and she also has to “walk the farm” each day to see what’s changed. When she lived in Texas she could grow cactus, in sand. Now she’s discovered she can grow pretty much whatever she wants to try. And try it we do, and who says you can’t grow lots of good food in small spaces! She has zucchinis growing in one of the big wooden containers she got. It’s a zucchini that’s supposed to stay smaller and was recommended for large containers. 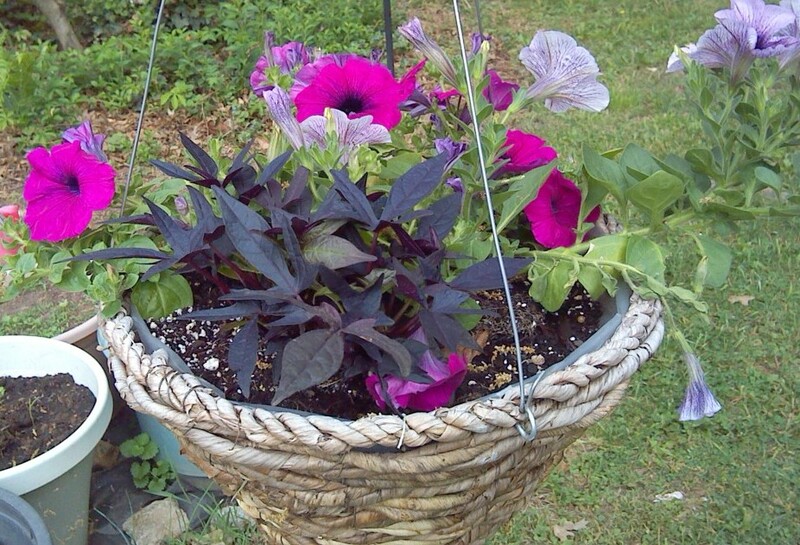 I started these in the kitchen and we transplanted them after they had a couple nice secondary leaves. (To show that there was at least enough root system underneath to support continued life after the shock of transplanting.) Now they all have small blossoms forming. 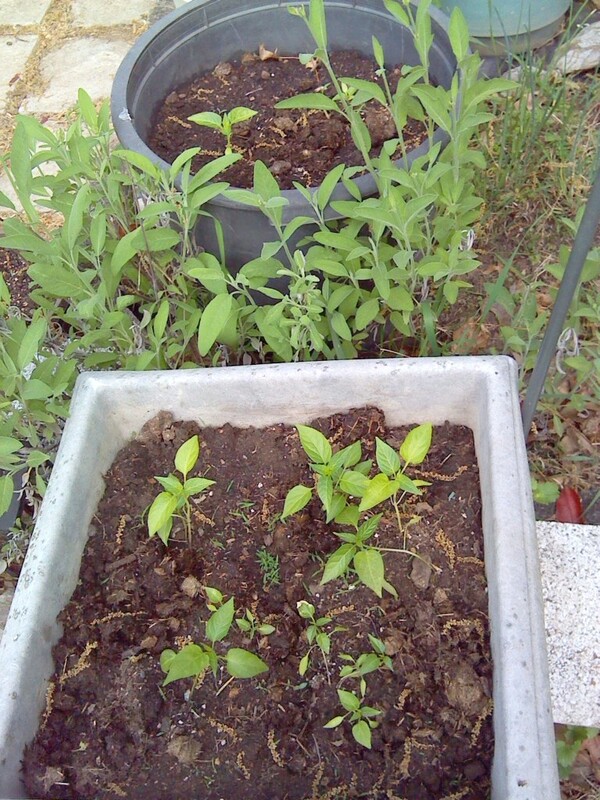 We’ve got sweet and hot peppers growing in pots, with my sage plants sticking out in between and chives behind. Chilies, jalapenos, sweet bells and some purple jalapenos that Eliza got seeds for. 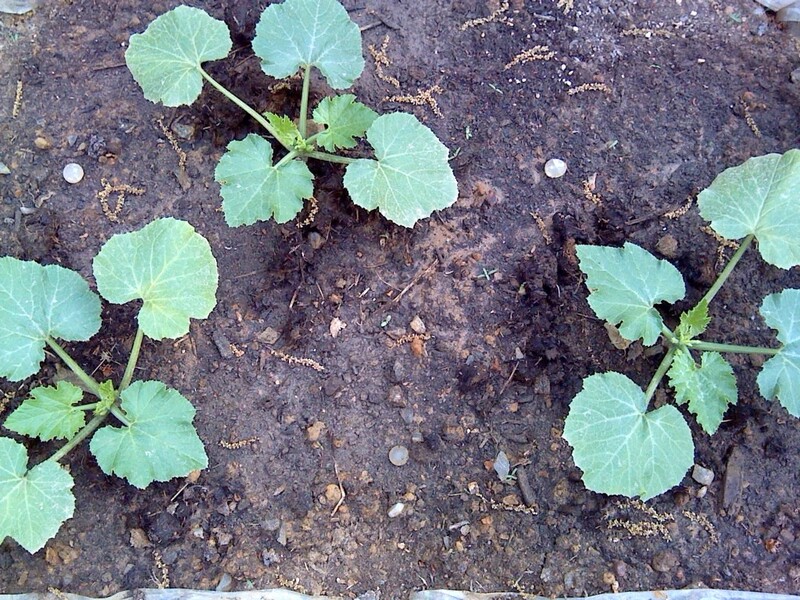 I started cucumber seeds in the house and just planted them out yesterday. I was glad to see them standing up well this morning. Beans, my favorite thing to grow, always continue to amaze me. 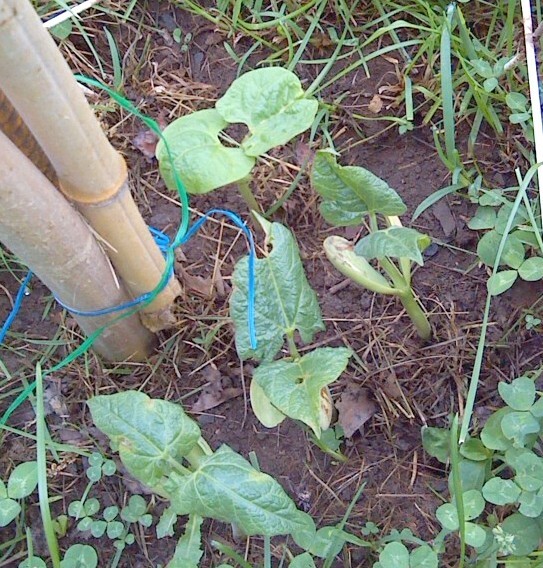 We built a trellis structure with bamboo and beans are coming up at each post. 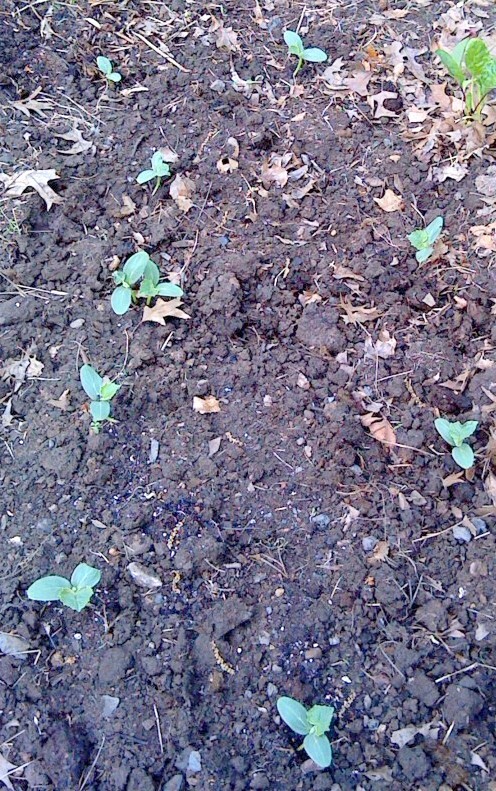 King of the Garden Lima beans start life large and continue that way too. Here are some at one of the posts with some grass growing around. I’ll get rid of most of the grass near them once we’re sure all the seedlings are up. They don’t mind having neighbors: they’re interested in going UP. 10′ up. 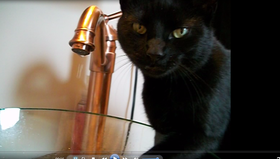 So on her soap box she goes: you know the things I always rant about, lol. These are all heirloom plants and I only use a natural fertilizer, good aged horse manure that a friend supplies to me. No poisons, nothing that changes the good earth that provides food here every season. The only seeds we needed to buy this year were the new things that have never grown here before, and then we’ll save seeds from those at the end of the season. Heirlooms, the way plants are supposed to be, not fooled around with, and giving us the kind of food that nature intended. The magic of nature; we shouldn’t try to make it better, cos that’s not possible. But you can’t eat everything, and we all need some pretty stuff growing too. Well, besides the lovely blossoms on all the veggie plants. If you garden, good luck and grow on! Tell your co-gardener that there is a cactus (Opuntia humifusa) that will grow where you live if she’s missing them at all. It likes well drained soil. Still a few weeks before I dare plant anything tender like squash or tomatoes here. 34 degrees this morning again. Thanks! She’ll read this but I doubt she really misses cactus, lol. Oh I hope your temps soon come up so you can get at all that growing! Weather should warm by Saturday again. Still, it looks like spring with all the green grass and leaves coming out on trees. And the rhubarb growing like crazy. If your friend is interested the cactus does grow naturally as far north as Long Island. Thanks Jackie. I’ll be sharing progress as we go cos I get more excited about it as things get bigger and start to really produce. So far all I’ve been able to harvest was some spinach, but we’re getting there! Can’t wait to see those yard long purple beans you’ve been going on about! Yea I do have flat land. Don’t you have flat land? I’m so curious to see what will happen with those yard long beans myself. And how they taste! Eliza says they’re really good. Stay tuned…….and have fun in your own garden! Seeing things grow in the garden… one of the most beautiful moments of the year! Absolutely, Herman. Enjoy your garden! AWESOME!!! Looks like everything is doing good! Thanks. It is all looking good!